Adversity can either strengthen the bond between two people or can break it. Coming to terms with an incurable disease is a journey where most times, creativity and generosity of spirit are not walking in step with that devastating reality. For Grammy Nominated Producer and Keyboardist Paul Brown and his wife April however, their passage along the cancer landscape has been marked by a deeper connection with each other and the need to give back to others in similar situations. 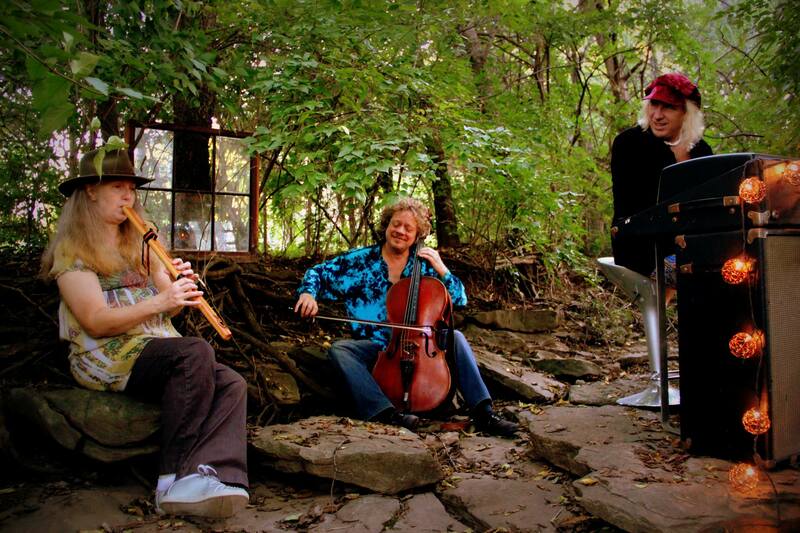 With their music, they hope to provide a means of relaxation and ultimately a feeling of peace and acceptance. Paul and April Brown’s journey began like millions of others; boy meets girl, sparks fly, they fall in love and figure out the plan to live happily ever after. It was working out just fine until April received a breast cancer diagnosis. After initial treatment and a few years of normality, the cancer metastasized and spread extensively throughout her skeletal system. In exploring her options to deal with the stress and physical suffering, April found comfort in retreats and wellness centers. It was there she first realized her desire to play the flute, and it is where her first musical collaboration with Paul began. 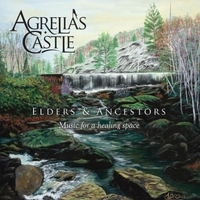 Paul and April Brown, using the name Agrelia’s Castle, have just released their debut album Elders & Ancestors, through Mysterium Records. The album’s music is meant to be therapeutic. 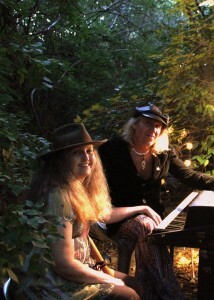 It takes you wandering with its calming melodies mixed with the sounds of nature and otherworldly vocals. As this music has helped them, Paul and April’s intent is to introduce this music into Radiation and Chemo Centers, Emergency Rooms, Wellness Centers, Hospice Centers and Nursing Homes. Basically, anywhere the stress and uncertainty levels of everyday living can be improved through the magic of healing music. With October designated as Breast Cancer Awareness Month, it seemed a perfect time to talk with Paul and April Brown about their life with cancer and of course, Elders & Ancestors. Kath Galasso: April, you were diagnosed with breast cancer over a dozen years ago and in 2009, you were told your cancer had metastasized. It was then you began to take advantage of the spiritual and emotional resources available, in the form of retreats and wellness centers. For others who may be in a similar situation, tell me how they were a benefit to you. April Brown: The first thing that I did was I reached out to Dave and Shannon at Wind River Cancer Wellness Retreat in North Carolina. They do lovely weekend long retreats which they provide free of charge for people who are going through cancer treatments. They have four or five retreats a year at their home, at their property. And that in itself provided an opportunity to get away from the constant barrage of medication, the stresses. You go over there and you are with other people who are going through what you’re going through. They encourage you to turn off your cell phones, there’s no TV or radio and it’s just lovely. 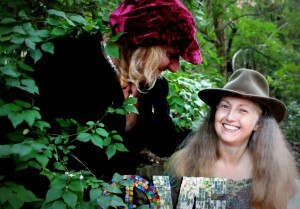 There’s a stream running through the property, and It’s really an opportunity to let go of everything and reconnect with who you are on the inside… outside of cancer. They also have workshops and there’s yoga, tai chi and other activities. So that was wonderful for me. But I also joined a support group at our local Gilda’s Club, which has been the most invaluable resource for me. Again, you’re with other people who were going through the exact same thing, and you can tell them things that you can’t say to your family because you don’t want to put all of that burden on your family. You’re dealing with a lot of stuff and your family is dealing with their own stuff and it’s hard sometimes to talk about everything that you’re really going through unless you’re with somebody that is going through the same thing. It’s a place to go to share with people your deepest, darkest feelings. And at the same time, I have learned from every person I met there. I have learned what is so important to me, about how to get through this. I encourage anybody who is going through any kind of chronic illness to find a support group. Paul Brown: And Gilda’s by the way, is completely and totally free, all their workshops. I go too. April and I actually go together every Wednesday. April: The support groups are moderated by social workers, so these are not amateur things, they are with people who are trained in social work and counseling. I think you articulated wonderfully about being able to tell other people what’s going on in your head that you wouldn’t want to burden the family with. I could see where that could be extremely helpful. And Paul, you touched on a little bit about being with April at these groups, talk a little bit about being a team in going through all of this. Paul: Well, the first part of April’s cancer I really wasn’t, I was really sort of disconnected in a lot of ways. But when I started going… we’re actually in two different groups. She’s in the group for people that have cancer and I’m in a group across the hall for people that are care givers. But we both go at the same time and a lot of people in my group have wives or husbands in April’s group. So it’s kind of like the same thing with me, there’s a lot of things that I don’t feel like I could talk to anybody about this except for people that are in exactly the same situation that I am. At the same time, when I started going to Gilda’s and even now, it really helps shape such a stronger bond between April and I. It just gave me a sense of we are starting to go through this together. It has been such an amazing experience and just being able to hear everybody’s stories. One person will say something and you’ll go “man, that’s exactly what I am going through.” Or, and I’m sure it’s the same way in April’s group, someone will say “I just discovered this sort of treatment or this doctor.” It really helps so much, especially for the caregivers, who might’ve never discovered these answers. You had only met a few months before the initial cancer diagnosis. While there’s no way the cancer diagnosis doesn’t become the elephant in the room, how were you able to grow your relationship without having cancer define it? April: Well, I was diagnosed in 2003 and Paul and I had just met and we were long distance. He lived in Memphis and I lived in Knoxville. I went through my treatment there, I had a lumpectomy and radiation, and at that point, I thought I was finished. You hope that’s going to be the end of it. You hope that you’re one of those people that you live the rest of your life and it was one of those things that happened and though it was an important part of your life, it wouldn’t come back. So once the treatments were over, life got back to normal for a while. We sort of had several years of a normal life together, building a relationship and getting married. We moved to Nashville a couple of years before I got the big diagnosis. So I guess we did have that opportunity even though our relationship had a cancer journey floated at the same time. We did have the opportunity to build a more normal life together. Paul: Cancer has taken so much from us in different respects, but then again, it gave us these moments, these tiny little moments of beautiful music and creative times together that we would have never had, or discovered, had she not gotten cancer. We’ve connected in ways I could never even have imagined. Ok, let’s talk about the music. How did the name Agrelia’s Castle come about? April: Well, we were all teenagers once right? Agrelia is the name that I gave to a unicorn that sort of came to me when I was a teenager. But my unicorn was a fierce green unicorn. Not those farty, rainbow ones, she was a real unicorn with a lovely shade of pale green. I gave her that name and later found out there was actually a town in Greece named Agrelia. And there used to be near the town on a map, Agrelia’s Castle. It was my utopia, it was the one place I wanted to go visit. I’ve never gotten there but maybe someday. So that’s where that name came from. “Elders & Ancestors” sets the tone for the album. Tell me a little bit about it. April: I remember the day we started recording that song in particular. Paul was on keyboard and I had a flute. I was supposed to play the flute; that was our intention. I got in front of the microphone and just felt compelled to sing instead of play. The singing part came first and it was something I had never done before like that. It just sort of poured out over whatever Paul would play. It was almost like it came through me. I would have to say that track I identify with the most. But that wasn’t the first thing you collaborated on. Wasn’t the “Guided Meditation album” for friends who run the “Wind River Cancer Wellness Retreat” the first thing you worked on together? April: The relaxation CD for Wind River, yes. We finished that right before we started this. I wasn’t even supposed to be involved in that. I volunteered Paul, and he said he wasn’t going to do it unless I was in the studio with him. So that’s how we got started working together and it turned out to be so much fun for me to be part of the creative process. Paul: Believe me, she would hum a little bit in the past but I never heard this girl really sing through all the years, not like that. All of a sudden she stood before the microphone and started singing these notes, and I was just leveled. For the longest time we had this relationship where I was the musician and I went to my gig, and she was a paralegal and she went to her law firm every day. So we never really had that kind of connection. Then she gets in front of this mic and starts singing these notes. “Wayfaring Stranger,” with Grammy winner Mike Farris singing lead combines new age, traditional folk and Mike’s gospel-blues vocals. It is so powerful. Why that song and how many nanoseconds did it take for Mike to agree to sing it? Paul: That’s an awesome way to put that question. April: I’ve always loved that song and I was playing it on the flute and I thought “we really need to do this.” And as for how long it took Mike to agree to do it; it was over here one time last summer when Paul was overseas and he came over to help unload my logs. We were sitting on the rocking chairs on the front porch and I asked him and he immediately said yes. I’m glad he did because it offsets everything else on the album. It’s just wonderful. April: We are so glad he did. He came in late one night, I was getting ready to go to bed, I didn’t know he was coming; Paul likes to surprise me with things. He came in and he sang… I just wanted to go slap him because nobody ought to be able to open his mouth and have that come out. Paul: And as long as I’ve been playing with Mike, I’ve never heard him quite deliver a vocal like that. The restraint but the emotion. And April and I are just sitting there in the control room taking it all in, looking at each other, giving each other emotional high-fives and thinking we can’t believe we are doing this. April: It was beautiful, we couldn’t ask for anything more from him. The last song I want to ask you about is “Agrelia’s Lullaby.” The feel of it at the end is kind of like it almost has you sailing off to another place, bringing you someplace else. Tell me a little bit about how that came about. April: That song is all Paul. He wrote the song. He sat down and played it. We had totally different plans for the song in the very beginning and it sat around for months. We weren’t working on it because we couldn’t figure out how to make it work the way we had planned for it to work. Then one day I said “Paul we can play part of this on the piano.” And that’s how we got to where we are now. All of the harmonies, all of the beat, I’ve got to give it to Paul; he basically hears these wonderful things and tells me what he wants me to do, and it’s magic. Paul: And again, before the discovery that I found in her, I actually found this out on the Bobby Rush record that was nominated for a Grammy. We were down there and she had an amazing ear for production and detail. And when we started working on the Wind River CD, she was more involved in the production than the singing and playing on this record. But through that process, I really discovered how amazing she is in the production field. On this record when you say it’s produced by April and Paul, she really has half ownership because she would come down with these amazing ideas that I would have never thought of. Like the piano on “Agrelia’s Lullaby.” I would never have gone there. Now Paul, I know where your influences come from: R&B, Rock, Blues and Funk. April, what were your musical influences? April: Oh my goodness, I was and still am a huge Alice Cooper fan. Paul: My favorite artist in the world is KISS Ladies and Gentlemen! I know you’re determined to get Elders and Ancestors into cancer and wellness centers, to Alzheimer’s patients and to other who you think will benefit from it. What’s your plan to do it? April: Well that’s why we are with Trish Bowden and Mysterium Music, because her mission like ours is to get music into the hands of caregivers, cancer centers, hospitals. She’s the person who’s going to help us make this happen. Paul: And in my travels too, I was in Ireland for a show with the Waterboys and we go to this little downtown area and there is this Hospice there. My Brother and fiddle player for the Waterboys (Steve Wickham) had done some performing there for the patients, so he introduced me and I was able to give our album to the head nurse in a Hospice. It’s a step by step process but we are on a mission to do that.